HELLO :-) No fainting allowed, but we are trying to catch up on our BLOG!! It is now 2Nov2014 and we are going to try to recapture July - my, but the time flies!!! We started the month by "updating" our Branch House Display Table. We more than doubled the size with a new, quick fold and height adjusting table that was part of a 3-pack. It looks so much nicer, and we have high hopes of it being a boost to the Branch and whatever visitors we may have for a visit. We were part of an Oldenburg Zone meeting shortly before transfer day came due. Our Zone is called the O-Zone (go figure) You can spot us on the right side, toward the back - as usual. 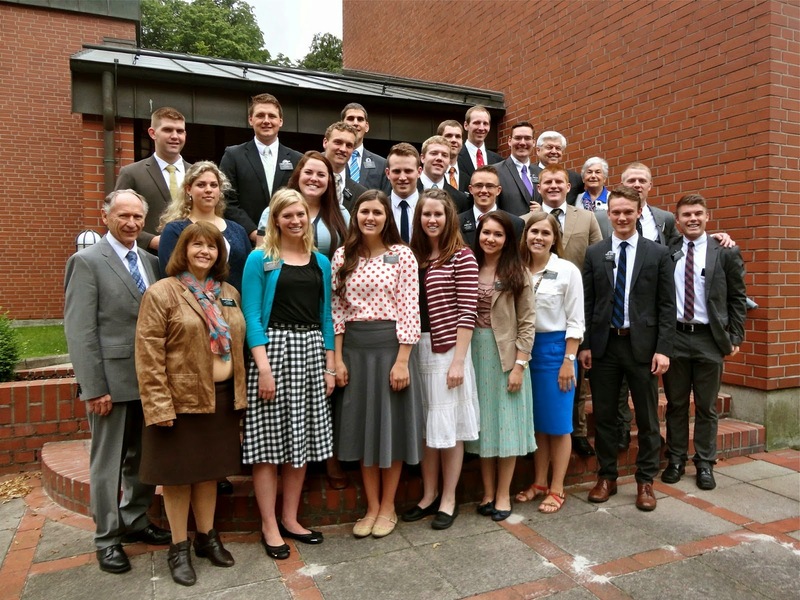 Shortly after the O-Zone meeting, there was a Missionary Couples Retreat in a nice part of Germany called Schwerin. The chapel building behind us has been there for some years, but the history was interesting to hear from someone who has been a long time member of the church in that area. The members sacrificed a great deal to be able to purchase a broken down barn and a little house on a nice piece of property. At that time, it was East Germany, and it was not especially "user friendly", but they persevered, and used a lot of the old lumber from the barn to build a meeting house. There was also the little house, and a couple was living there, so the members traded an apartment of one of the members, which was much nicer than the little house. The members moved into the little house in order to be able to work on the meeting house as the old barn was torn down, piece by piece, and the little "chapel" was build to hold meetings in. me at a very nice meeting. OK - get ready - the following are random pics of our group. President Kosak standing - with a tie and no hat. The Brother to his left is the member who gave his historical insight, and I am really sorry I don't have his name at the moment. As I recall he has served as a Stake President and many other callings over his lifetime of service. He also wrote a book recalling the days of the struggles in East Germany. Elder Benson (California) takes a pic. President Kosak makes the rounds to say hello to everyone. Lunch/snack break also known as picnic, or soft drinks, sandwiches and CHOCOLATE!! Can't let this one go without getting involved. The "girls" (Sisters) also did more than fair share - but then what's new. 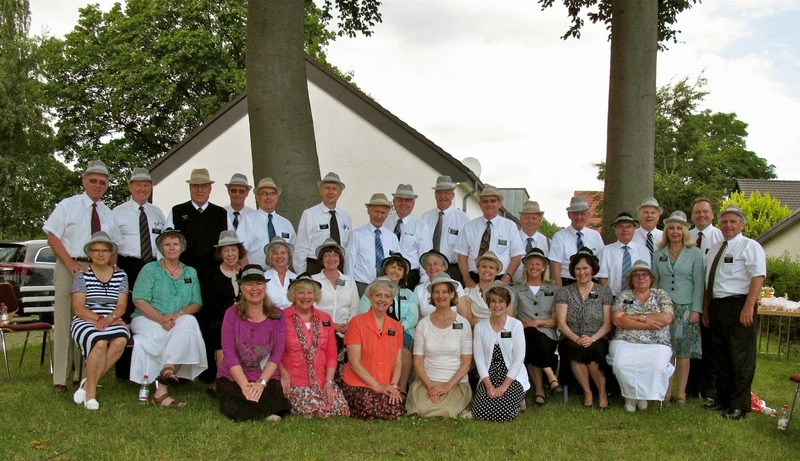 The fun maybe, but they all seem to do well when they are also busy with their callings all over the Germany Berlin Missionfield. YEP - It's dinner time the night before our meetings with President Kosak. We spent all afternoon walking around town, buying hats and trying to avoid trouble - we did well - BUT now it's time to EAT!! The potato balls on the right of the Schnitzel are called Salzkartoffeln - salt potatoes because they are boiled in salt water. Fries taste better, but hey - it's food and it's all GOOD. Just like one would expect in a OLD restaurant - ambiance and lots of food for the huddled masses. Lunch the next day (17th July) after our meetings. To the left are Elder and Sister Snow - must be Snow cousins, but we haven't taken time to look back on our Genealogy - either one of us.... Elder and Sister Tenney are to their left. Left corner are the MacCombers who are on a history mission - they take pictures of records, etc. and they go back to the Church for processing and archiving for Family Search, etc. 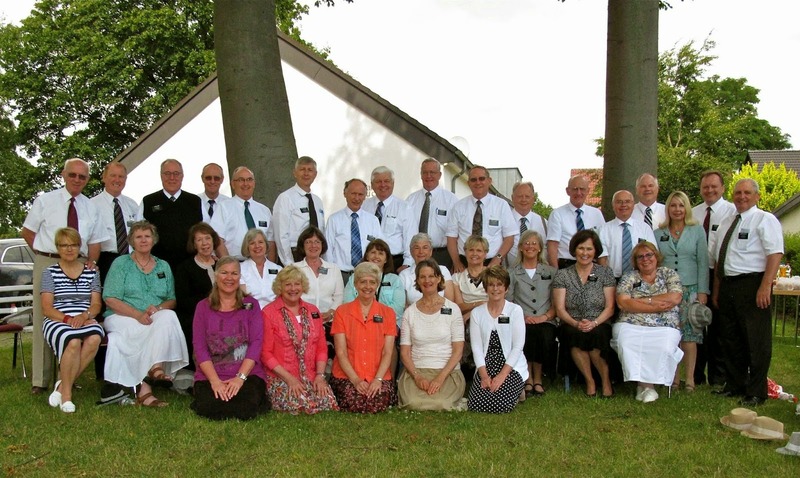 To their right are Elder & Sister Kunz who arrived in the mission filed just a few weeks before we "retreated". And AGAIN - to the left lower corner is a very beautiful lady missionary, sitting next to President Kosak - who is sitting across from the table from his wife (whom I cut out of this picture in order to get my wife, whom I was sitting across from). Next to President Kosgak is Sister Benson, who is sitting across from her husband, Elder Benson...... Getting confused yet??? This is NOT the castle at Schwerin!!!! BELOW ARE THE PICS OF THE CASTLE AT SCHWERIN!!! Beesleys & Snows awaiting the tour. Helping Herc - or just thowing some bull? Stay tuned - but keep on breathing.